Today we just make a delivery to our Africa customer a turbine oil purifier, this customer is our old customer who purchase several oil filtration equipment from us. Turbine oil purifier machine is especially doing oil filtration work for lubricating turbine oil, which will get contaminated by high temperature condition from the turbine lubricating system working. When the lubricating turbine oil contains more water, it will become emulsified oil, like milky status, which one will perform poor lubricating function to the turbine lubricating system. So it’s key important to purify the turbine oil and keep the oil always be cleaning for use. Since turbine oil is very easily to gets emulsion, and the the main problem of turbine oil is water in oil. It will be free water and dissolved water, which is very difficult to be removed in oil. 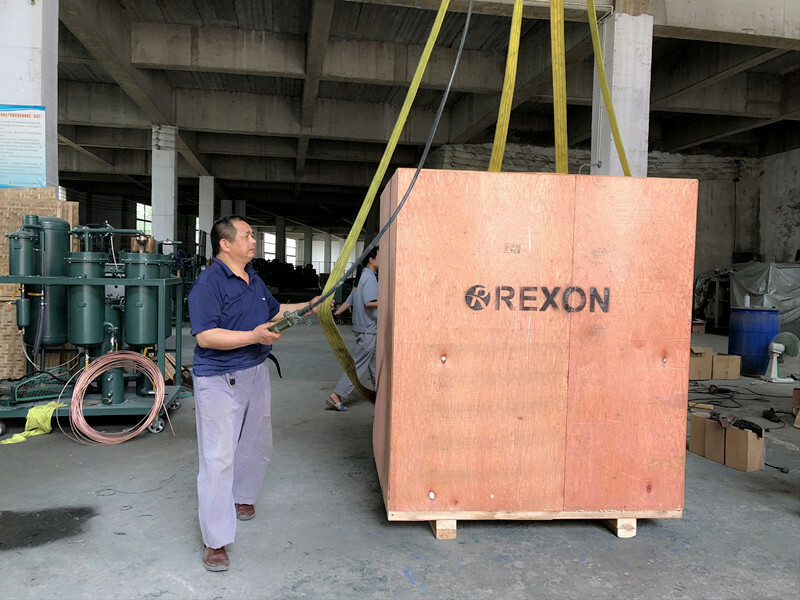 According to turbine oil’s features, Rexon turbine oil purifier takes advanced oil dehydration and water separation technology, which can solve this oil problem thoroughly. Rexon turbine oil purifier, your good choice to solve your turbine oil problem, and keep the oil cleaning. Prolong the lubricating system’s lifespan too.